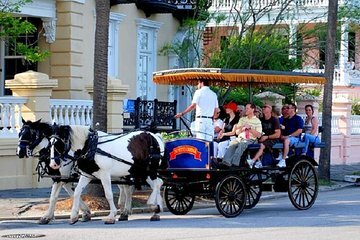 Includes a ride in a Horse-Drawn Carriage, guided tour of Boone Hall Plantation, and a Charleston Harbor Cruise. You can also purchase snacks aboard the Carolina Belle. If you would like to purchase anything during the trip, please bring cash with you. Our motor-coach bus will pick you up from each location and transport you to the next. Lunch is served while on the Harbor Boat Cruise. We had a very comfortable ride on the coach bus from Myrtle Beach to Charleston. We loved the city historic carriage ride and our tour guide was excellent and very knowledgeable. We had more than enough time at the market before we got back on the bus for the harbor tour where we had a really nice boxed deli lunch waiting for us. Our favorite part of the trip was the Boone Hall plantation tour but we just wished that we had more time at this stop to see more of the plantation. We did get the guided tour of the home and a wagon ride around the beautiful property but because we had such a short amount of time, we were unable to see the slave cabins or other buildings on the property so we were a little disappointed with our time restraints on this stop. Highly recommend this trip. Well worth the money. If you are looking for a one day informative trip packed with adventure and information then this is the trip for you. You have to be able to keep moving however. We had to get our bathroom stops, ice cream stop and shopping done in a very quick manner and keep moving to make the established time lines. It wasn't terrible, definitely ok for us but if you have small children, elderly or folks who just want to take their time then this trip may be a bit too much for them. We had a great time and appreciated the chance for a carriage ride, boat ride and private tour of plantation all in one day. Bus was comfortable and bus driver was friendly and professional. Total of a 5 hour bus ride, driver was great. Could if offered water, didn't inform on web site that we would have to be driven NorthCarolina from south. I was under the impression the boat ride would be that. The carriag ride was nice. Still didn't get offered water. The boat ride was stupid along with the lame and the sandwich was horrible dry and small. The plantation was great. All in all the communication was terrible, and half the day was riding in a bus. Would definitely take my money back. Excellent way to see Charleston in a day! I highly recommend this tour. We enjoyed the boxed lunch which was a pleasant surprise. Great tour. Better than driving yourself for first timers. The only negative...not much time to really look at the market. Our carriage driver was great! This was a very pleasant trip and well worth the price. The bus ride was comfortable, and had on-board WiFi as well as an introductory history video. This was our first time in Charleston, so we appreciated the land, sea, and plantation mix. The sights were beautiful and interesting at the same time. All phases were steeped in the history of the area and each tour was given by highly knowledgeable people. Even the self-guided portion of the plantation tour offered narrated dioramas of the history of slavery. We had considered driving the two hours each way and were so glad we used the Day Trip option instead. As always, these tours expect prompt adherence to the boarding times--in this case, strictly so as there were so many things to fit in. The tour ends in the open-air crafts stalls and shops, with many interesting locally-made souvenirs. Each leg was accommodating to elderly or those with some difficulty walking very far, though we did not inquire about handicap provisions which were not obvious. Even in the rainas it was during our tour this was an excellent tour. Not able to get out on the deck for a higher level view but. . . Still great. Learned a lot about our history and the way SC and Charleston played such a dynamic role. The lunch that was provided by the tour package was adequate and we really feel the time commitment was just right. Excellent value for the dollar!